Hope and encouragement for the hurting. Spiritual insight for those who want a closer love relationship with God. 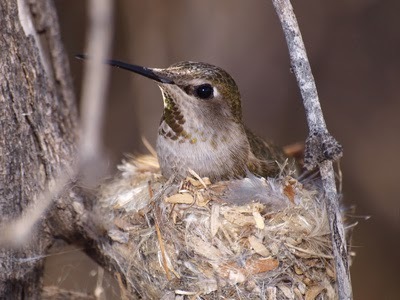 When a hummingbird builds a nest, the bird does not think ahead of time, "I will build a beautiful nest." She instinctively gathers tiny sticks, feathers, and soft things that please her, mindfully and enjoyably doing what is natural, just one pleasing piece at a time. And then, as if by magic, a beautiful, safe nest is created by God. When we see that God is tender, and become still with that safeness, and do just one thing mindfully in freedom and faith, we effortlessly build something beautiful from God. In the Bible, Satan is called the father of lies. 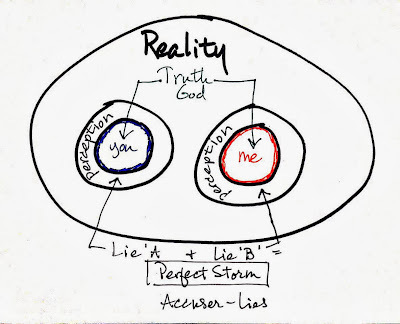 Lying is Satan's MO and one of the primary ways that he works against us, including in our marriages and relationships. Take a look at the diagram. The innermost circles are the minds and hearts of two people in a relationship. The outer circle is reality or truth. Only God can see reality in a way that is pure and undistorted. The rest of us perceive reality through our five senses and we color that perception with our thoughts, emotions, and experiences. This perception barrier is represented by the middle circles. So, when an event happens, each person in the relationship sees that reality in a slightly different way, filtered through their own perception barrier. Satan cannot get inside us, but he can influence our thoughts, perceptions, and feelings. So, he inserts Lie A into your mind, and Lie B into your spouse's or friend's mind. Now the perception barriers are even more distorted. He orchestrates these lies to work against each other to create the perfect storm. 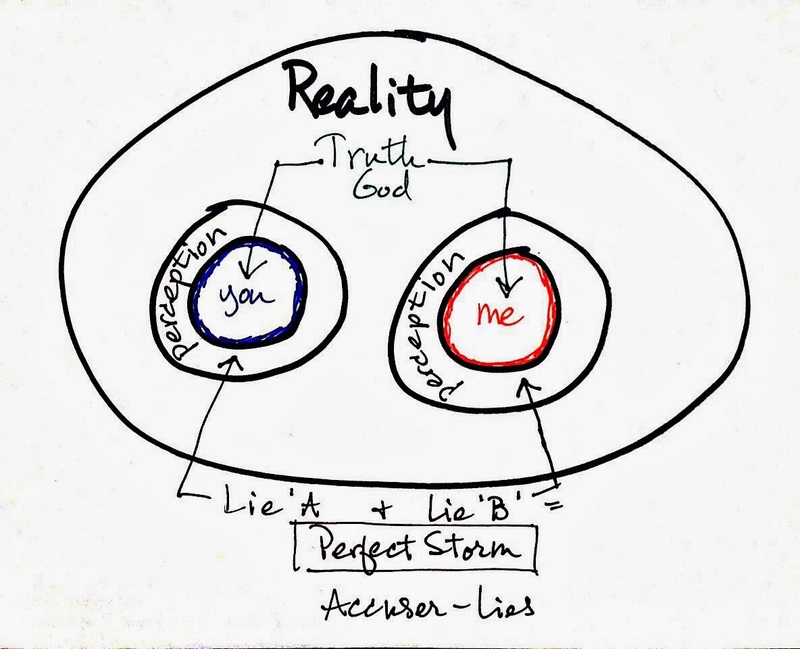 These lies often come in the form of accusations against the other.Thankfully, God, the one who created reality and sees it perfectly is able to insert His truth into our very core, and He is on our side. Let me give you an example. Mark and Susan have an older car and the expenses for repairs are becoming more and more frequent. Mark believes his family should have a new, dependable car and Susan thinks they should wait until their existing car dies. Mark is motivated by a desire to protect his family and Susan wants to be a good steward of their resources but the Accuser tells Mark that Susan is a cheapskate and Susan that Mark doesn't care about their financial security. If a situation like this arises, first pray for God's perspective. He sees the situation objectively, with perfect clarity. Then take the time to ask lots of questions before accusing or jumping to conclusions. For example, “Can you help me understand the reasoning behind what you're saying?” “What financial numbers are we looking at?” “Are there options we're not looking at?” Gather all the facts you can and make a list of pros and cons. As you seek to understand another's perceptions, remember that you are not perceiving reality directly either. As you explore, you may get some insight into your own barrier and see some possible misconceptions you may have that are contributing to the situation. We want to spend less time convincing and more time understanding. We want the grace to give others permission to have their own perception barrier, to see the world as they do. As we work at discovering and understanding the perception barriers of others, we not only understand another person better, but we understand reality better, seeing it from a point of view outside our own. And maybe we can have fewer, less intense conflicts, and greater harmony. Sometimes it's hard to know if a task set before us is something God wants us to do. 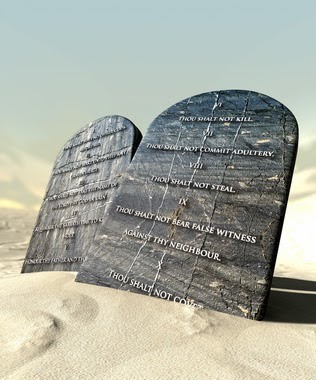 The difference between the old covenant law and the new covenant law gives us some insight. God gave Moses the law written on tablets of stone (Exodus 31:18). Today, under the new covenant, the law is written on our living hearts (Romans 2:15). When something feels like a heavy weight on our shoulders, an obligatory should, a pressure from outside ourselves, that is usually the tablets of stone. When I feel this way, I question whether it is from God. When the impetus to do something comes from within, a pressure from the inside wanting to get out, that is usually the law written on our hearts. The thing may be difficult and take us out of our comfort zone, but it comes from inside. Of course, this is not infallible. There are often things that feel weighty and obligatory that obviously have to be done, like changing a dirty diaper or mopping the floor. On the other hand, a compelling desire can come from within and be totally wrong for us. But this principle has proven to be true many times for me as I have sought the Lord's will. I hope that when you are facing a decision it may be helpful to you as well. Best source for books on family! As of 2011, all the pictures on this blog have been legitimately purchased from fotolia.com. If you are the copyright holder to any of the older photographs herein, do not hesitate to contact me. They will be swiftly removed if you desire so.